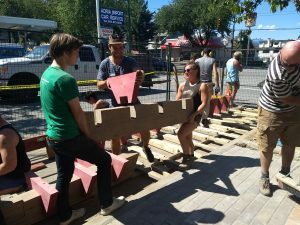 The Parklet outside of Mount Pleasant Neighbourhood House has been built! The summer weather definitely made itself felt over the course of our 3 day build from July 20 to July 22, 2018. Despite the heat, spirits were high, water and treats were flowing, and it was great to see this corner of East Vancouver get transformed. A protective fence, pylons, and no-parking signs went up a few days before the build. This helped us keep the build crew safe and set aside some space for our deliveries. By Friday, gravel, soil, and sand, pavers and our beautiful processed old-age timber arrived and our volunteer crew quickly mobilized to move deliveries into place. They then got to work on removing topsoil from the boulevard and ever so gently relocating the Community Garden into pots. Volunteers sanding and staining reclaimed cedar wood. See more parklet pictures here. Saturday morning was our busiest time with lots of hands eager to see the parklet take shape. The shade was with us as we dug out more of the boulevard and leveled it with a mechanical tamper. 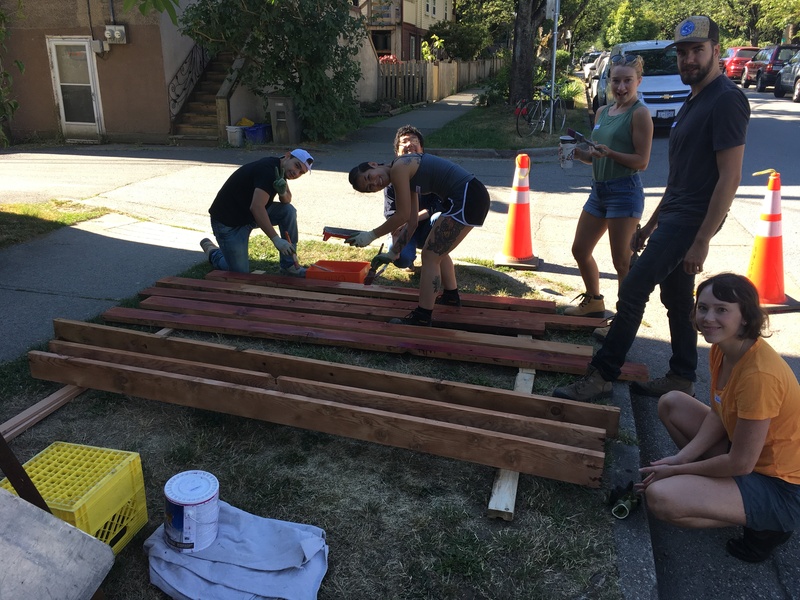 We stained and painted some more to make sure our wood could stand up against the West Coast climate and to add an accent colour to the parklet. The shade began to move, but we enjoyed the July sun with some tunes as we sanded our decking and assembled our beautiful table with prefabricated metal legs. Sunday saw a lot of work coming together. We kept on digging (becoming experts now!) and made room for our sonotube footings. We lay down our pavers and even had to cut some down to fit exactly where we wanted them to! We hand-mixed our fast drying concrete (they call it Quikrete for a reason!) and placed our tables and benches into their footings. Like large lego pieces, we put together the painted pieces of the reclaimed wood to form the base of the parklet bench. We also made the planter portion of the parklet, putting down filter fabric, before piling on soil and planting new indigenous plants. Interlocking precision CNC’d wood was a Lego lover’s dream come true! More parklet pictures here. Now that the fencing has finally been removed, the parklet is ready for its Grand Opening celebration! We would like to invite you for cake, lemonade and ribbon-cutting ceremony as we celebrate this new public space! Join us on Friday, August 24th from 1-2:30pm. To learn more about the parklet and how you can support the project, visit mpnh.org/parklet. The parklet would not have been possible without our Partners: Haeccity Studio Architecture, Mount Pleasant Neighbourhood House, Upcycle Vancouver, Vancouver Economic Commission, Neighbourhood Matching Fund, the City of Vancouver, VIVA Vancouver, Scandic Construction and Projects in Place Society. And our amazing parklet Supporters: Rize Alliance, Western Reclaimed Timber, Ba Le Bakery and Deli, NADA Grocery, Home Depot, Buy-Low Foods, Kingsgate Mall, Cedar Rim Nursery, Allium Landscapes, Headwater Management, BC Brick, Naturally Crafted, and Abbotsford Concrete.